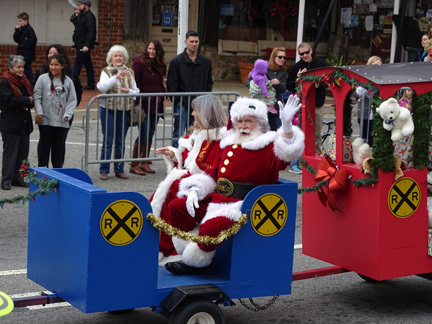 Kennesaw’s Santa Parade Winners and more! The winners were as follows: Most Humorous: #37. The DeRiche Agency – Do You Want to Build a Snowman; Most Colorful #21B: Reliable Heating & Air ; Most Unusual #23 Due West Elementary School. Unwrap the Gift of Music. All the students were wrapped in Christmas gift boxes; Most Spirited #42: Cub Scout Pack 350: Scouting for the Holidays. This float has American flags every where and an awesome Christmas Tree decorated with more flags; Most Musical #6-B Great Gig Dance Co.; Best Entry with Animals #13: Second Chance Greyhound; Best Overall Float #35: Hillcrest Baptist Church – A Cozy Country Christmas, complete with a log cabin. Most Spirited #42: Cub Scout Pack 350: Scouting for the Holidays. This float has American flags every where and an awesome Christmas Tree decorated with more flags. Most Musical #6-B Great Gig Dance Co.
Best Overall Float #35: Hillcrest Baptist Church – A Cozy Country Christmas. A big thank you to Asha and RJ Patel for being the Grand Marshalls, a special tip of the hat to Sara B Frey – 99 years young riding with her son, Joe Bozeman and the youngest member of the Historical Society and thanks to David Pies, Kennesaw Parks and Rec, Michael Everhart, Great Gig and the Judges: Carol Thompson, Bright Side Newspaper, Laura Strausberger , Kennesaw Police, and Judy Hobbs, City of Kennesaw.